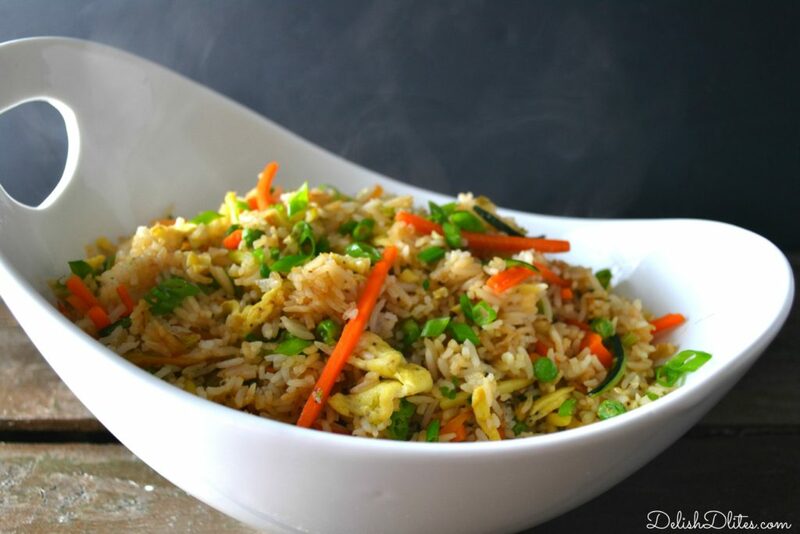 I’m a huge fan of Asian inspired recipes, and fried rice is one of my favorites. 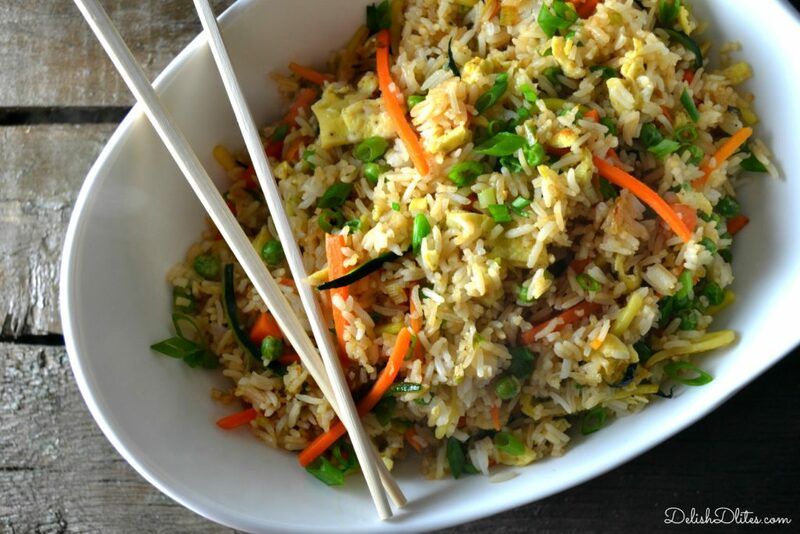 Not only is it delicious, but fried rice is a great way to use up veggies in your fridge. The sky is the limit for the veggie combos you can use. I happened to have zucchini, carrots and peas on hand, but you can use diced asparagus, corn, green beans, whatever you like. 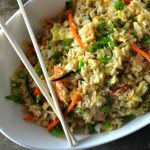 Take the guilt out of greasy, gross take out, you can toss this healthier veggie fried rice together in the same amount of time it would take to get it delivered! Heat a non-stick pan to medium low heat. Add 1/2 tablespoon of sunflower (or canola) oil, then pour in the beaten eggs. Tilt the pan to spread the eggs out. Cook until the egg is slightly golden brown on the underside, then flip it over and cook it for another minute. Remove the egg omelette from the pan, then cut into small pieces and set aside. In the same pan, add the remaining sunflower oil, then raise the heat to medium. Add the garlic, ginger and white part of the scallion, and cook for 2-3 minutes, until fragrant. 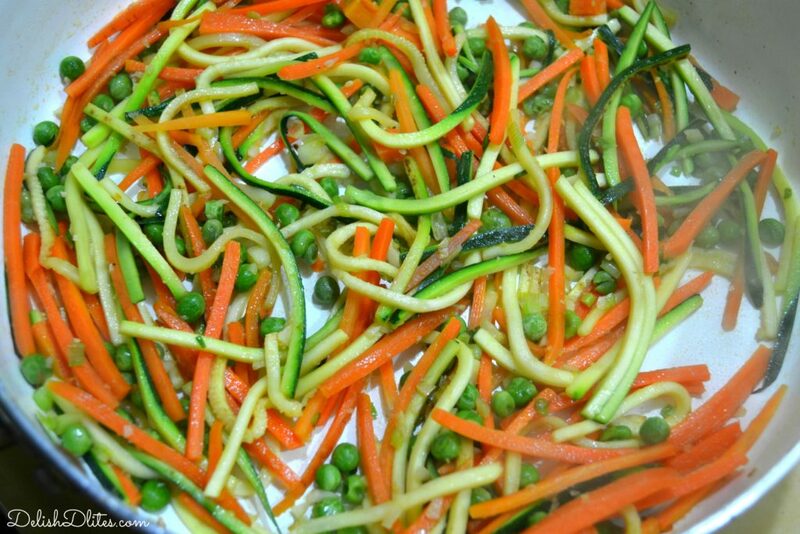 Add the carrots, zucchini, and peas. Saute the veggies for 4-5 minutes, stirring frequently, until the carrots and zucchini become slightly tender. 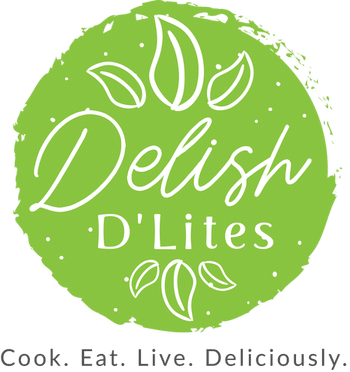 Season them with a small pinch of salt and pepper. 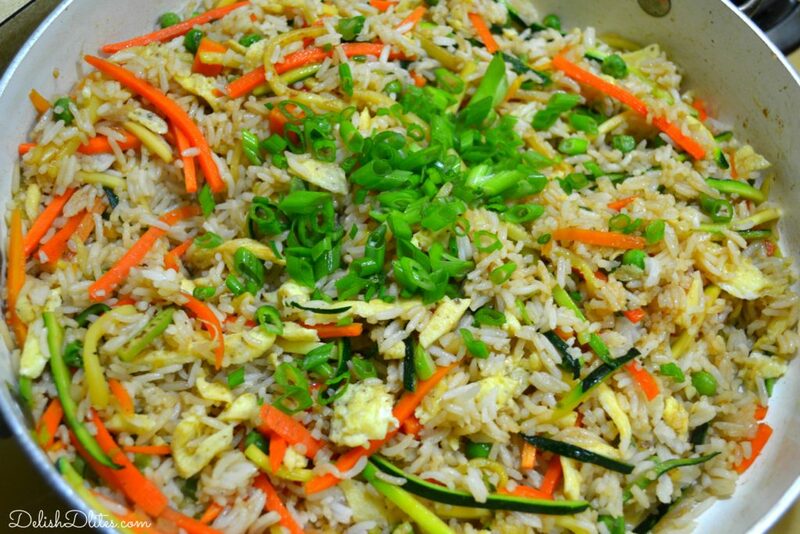 Add the rice into the pan, then combine the soy sauce, molasses and sesame oil. Pour the mixture over the rice/veggie mixture and toss to coat. Toss in the remaining green onion, and the cooked egg, then stir again. 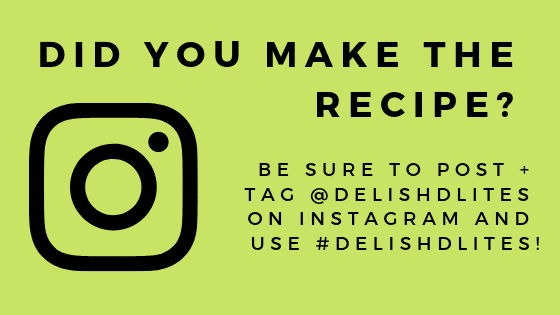 Heat a non-stick pan to medium low heat. Add 1/2 tablespoon of sunflower (or canola) oil, then pour in the beaten eggs. Tilt the pan to spread the eggs out. Cook until the egg is slightly golden brown on the underside, then flip it over and cook it for another minute. Remove the egg omelette from the pan, then cut into small pieces and set aside. 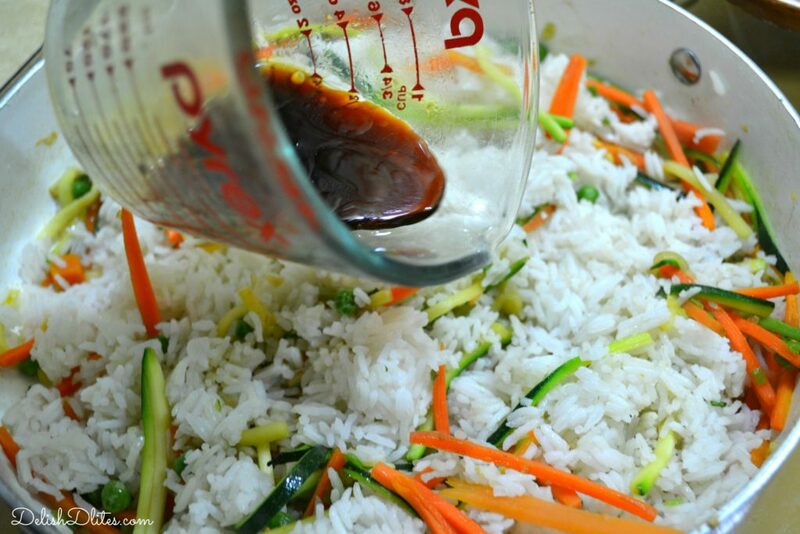 Add the rice into the pan, then combine the soy sauce, molasses and sesame oil. Pour the mixture over the rice/veggie mixture and toss to coat.